Back in 1968, just before the start of the Olympic Games in searingly hot, uncomfortably high altitude Mexico City, the late Chris Brasher sounded an ominous warning. “There will be those who die,” he thundered in The Observer. He was right. Some 300 civilians, mainly students protesting about the repressive regime and escalating cost of the Games in a relatively impoverished nation, were infamously massacred by Mexican Government troops in the Plaza of The Three Cultures. It remains one of the most shameful episodes in Olympic history. But no-one died during the Games from either the hot air or the thin air, to which Brasher was actually referring. Stadiums for the 2022 World Cup in Qatar will all feature state-of-the-art air conditioning systems. Brasher’s false prediction has come to mind now we have this brouhaha over whether the 2022 football World Cup scheduled for Qatar should be moved either to an inconvenient winter month or even elsewhere because the summer climate in the Gulf state is too hot to handle. Yet is that really so? Would the conditions be that unbearable for the world’s top footballers? Shouldn’t these highly-paid professional athletes – many extravagantly so – be sufficiently prepared to cope with any extremes of climate with all the state-of- the age medical and scientific back-up at their disposal? Surely the rewards and ample enough and their bodies well-honed enough to take the rough with the smooth, the hot with the cold? Yes, the weather in a Qatar summer is stifling. But so it is in Pakistan, India and parts of Australia and South Africa where Test cricket is played without any beefing about the temperature being in the nineties – or more. 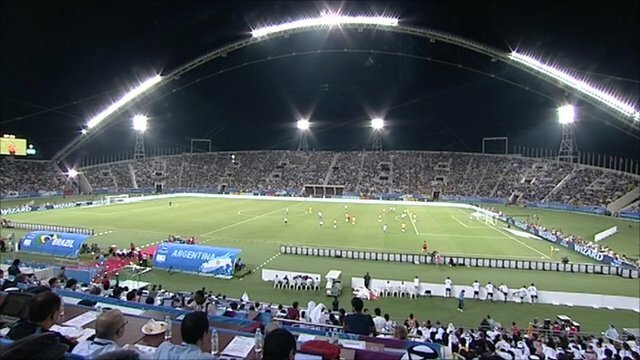 While that daytime summer in Qatar – as in most Middle East nations can be pretty fierce it is certainly cooler in the evenings when the majority – if not all – the matches would be played in air-cooled stadiums. Indeed, spectators may find it distinctly chilly in the nether regions when the air-con kicks in under their seats. So far we haven’t heard any complaints from Latin American, Asian or African nations about the Qatar climate. Only certain Europeans. Why shouldn’t we adapt as do those teams from the tropics when they come to an often less-than-balmy Europe when a World Cup summer can wet, wild and windy? My question is, if we can play sport at 40 degrees below, as in the Winter Olympics (eg Lake Placid 1980), why not 40 above? At the moment sport’s ruling bodies seem to be blowing hot and cold over whether nations which have extreme heat should be excluded from staging significant major events. FIFA and Sepp Blatter may believe they have taken the heat out of the situation by delaying any decision on any seasonal switch for the 2022 World Cup until next year but the controversy over hotspots like Qatar extends beyond football. The country’s capital, Doha, is mounting a strong bid to stage the Olympic Games two years later and their right to do so is firmly backed by London 2012 chief Sebastian Coe. The British Olympic Association chairman, speaking on a recent visit to Doha, added: “If you are going to build a global capacity in sport you are going to confront challenges. Some will be climatic, political or social. The great thing about sport is that it always manages to bridgehead change. “My view is that we’ll probably need to have a global conversion at some stage, across sport, about the calendar and the ability of some countries to stage sports events when it is climatically beneficial for the competitors. That’s one of the challenges of building a global capacity for sport. “If we said 20 years ago that Rio would host the Olympics or South Africa the World Cup, few would have believed it. Doha has already bid unsuccessfully for both the 2016 and 2020 Olympics and Qatar’s Olympic Committee has said they will ” keep on bidding until we win”. Traditionally the Olympics, like the World Cup, take place in summer months but can be more flexible. Tokyo 1964 and Mexico City 1968 were both held in October because of the climate; similarly Sydney 2000 and Seoul 1988 started in mid-September. Yet the hottest Games of the dozen I have attended was in a sweltering Moscow in July 1980, when temperatures soared into high nineties – and one Sebastian Coe won the first of his 1500 metres gold medals. Obviously some like it hot. That was certainly so in the Philippines in September 1975 when Muhammad Ali and Joe Frazier fought with such unremitting ferocity in “The Thrilla in Manila” – the greatest fight I have ever seen – when the ring temperature hit 110 degrees! As it happens Qatar is not the only nation due to host a major international sports event sweating over the weather. While the controversy surrounding the the 2022 football World Cup, approaches boiling point there is now growing concern over the climate for next February’s Winter Olympics in Russia’s Black Sea resort of Sochi. Ironically, it may not be cold enough. Forget any prospect of a bitter Russian winter sending a chill through competitors; apparently the long range forecast predicts it will be well above freezing point at what is not a natural winter resort. Indeed Sochi, which has a sub-tropical climate for most of the year – it reminded me of Cannes with caviar when I was there a couple of years ago – seemed an eccentric choice by an International Olympic Committee swayed by the persuasive presence of President Putin when the vote was taken in Guatemala. The average February temperature of Sochi is usually 10 degrees above freezing. Last February it was 18.5 (66 Fahrenheit) and several test events were cancelled. The current forecast suggests it may be even higher, with the possibility of heavy rain a huge threat to the skiing and and sledding events. After similar conditions hampered the last Winter Olympics in Vancouver the IOC have been well aware of the potential weather risks to Sochi – which seem far greater to a successful Games than security, overspending or protests against Russia’s rigid anti-gay laws. Huge piles of last year’s snow have been stockpiled under insulated covers in what is the world’s biggest snowstoring operation. Additionally snow cannons will be on standby in the nearby Caucasus Mountains which form a scenic backdrop to the resort but experts acknowledge it will be difficult to produce sufficient artificial snow at that temperature when it is also raining. Not-so-cold comfort for Putin’s grandiose Games plan. Meantime, as Lord Coe says, the landscape for bids and delivery of sport around the world has changed. Indeed. Athletes and administrators must learn to cope with sport’s own climate change, adapting to prevailing conditions wherever it may be, whether Sochi or Sudan, Qatar or Quebec. Because, we witnessed in Mexico City, bullets are far more lethal than snow or sunstroke. Alan Hubbard is a sports columnist for The Independent on Sunday, and a former sports editor of The Observer. He has covered a total of 16 Summer and Winter Games, 10 Commonwealth Games, several football World Cups and world title fights from Atlanta to Zaire.